The lunar event will be seen across Ireland and the UK and other parts of the Eastern hemisphere tonight and tomorrow morning. 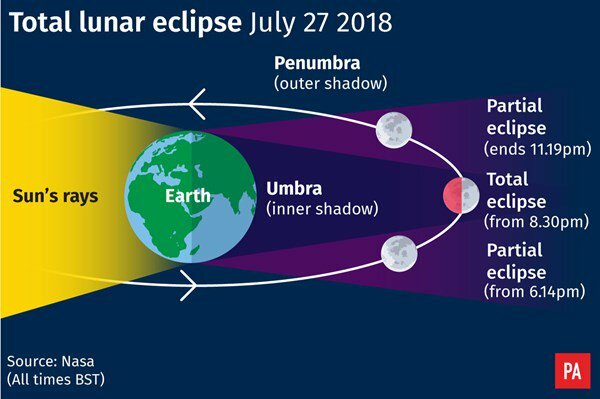 Possible cloudy skies aside, people across Ireland will have the chance to witness the longest total lunar eclipse of the 21st century this Friday, July 27. As it lines up with the earth and sun, the rising full moon will darken and change from silver to rusty or blood red - hence the moniker, blood moon. Our ancestors once viewed the blood moon with fear, believing it heralded a period of disaster. Adding to the spectacle, Mars will appear directly below the blood moon at close to its maximum brightness. The last time the Red Planet appeared bigger or brighter than it will this week, was back in 2003, when the distance between Mars and the Earth closed to less than 56 million kilometres. Observers will also have a chance to see the International Space Station (ISS) as it passes overhead during the eclipse and the planet Jupiter will also be visible. 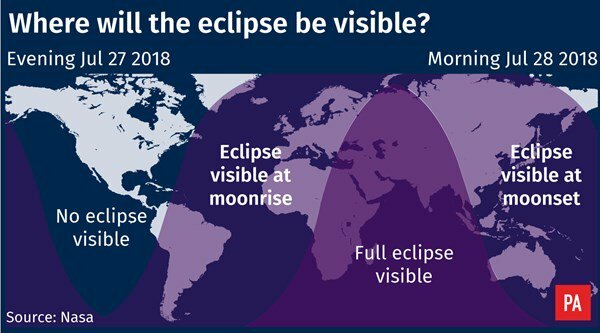 The eclipse is set to begin at around 9.20pm on Friday, July 27 and will last for just over three hours, finishing at around 12.30am on Saturday morning. Cloud cover will impede viewing in some areas. Unlike a solar eclipse, the blood moon and Mars can be viewed safely without the use of any eye protection.